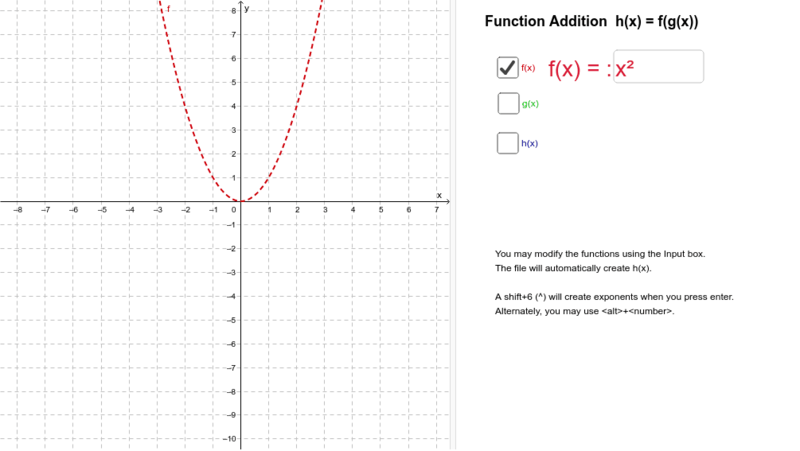 This applet will illustrate the addition of two functions, f(X) anf g(x). f(x) will graph in red, and g(x) will graph in green. The sum of the functions is called h(x) and will display in blue. By clicking on the appropriate checkbox, you will be able to display each graph separately of together. This applet can be used by teachers in a demonstration mode in the classroom or teachers can have students load it on their own computers with a worksheet to be complete for a grade.